As press and watch enthusiasts stream into Messeplatz Halle for BaselWorld 2014, exhibiting brands are busy unveiling their latest horological creations, often having taken years to complete. Since BaselWorld’s opening this Thursday, Hublot has released nine new models; some including an entirely new material to the watchmaking industry. 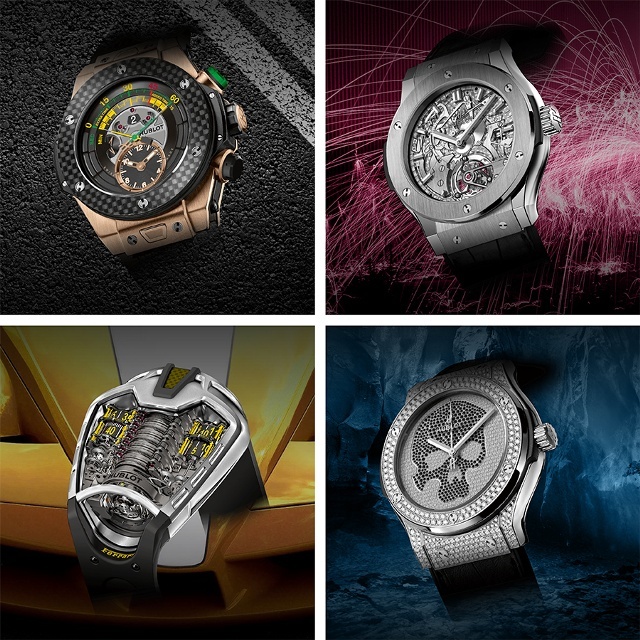 Scroll over the interactive images for video content and closer looks at the timepieces. Full interactive features on various formats available here. The Classic Fusion Tourbillon Firmament includes, for the first time in a timepiece, osmium crystals. Hublot’s use of the material required years of research, as Osmim’s melting point is over 3,000 degrees Celsius. Osmium is one of the strongest metals in the world. The densest naturally occurring element, Osmium is part of the platinum family and when crushed into minuscule crystals, produces a celestial effect. 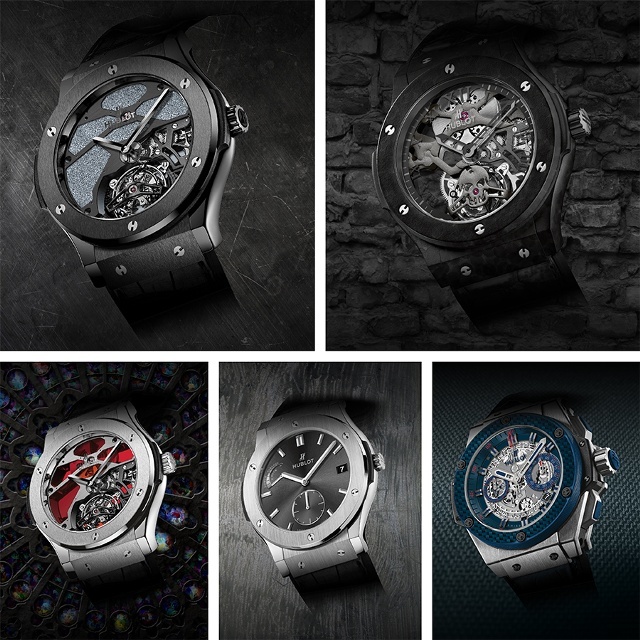 Two other members of the Classic Fusion Tourbillon family released this week play with the concept of transparency. Inspired by stained glass, the models utilize a glass made by an aerospace company known for its telescope production. the material is treated to filter light frequency, resulting in only the desired color. Hublot accounted for the traditional as well. The new Classic Fusion Power Reserve 8 Days features refined lines, pushing the ultra-bold boundaries the brand has become famous for. The HUB1601 movement within the titanium case is manually wound with a Swiss lever escapement and boasts a frequency of 3Hz. Scroll over the interactive images for video content and closer looks at the timepieces. Full interactive features on various formats available here. Go darker with the Classic Fusion Tourbillon Skeleton. This timepiece showcases a skeleton movement with a skull motif surrounded by a ceramic-coated aluminum. This isn’t the only model with a dark side in the line-up. Another Classic Fusion, the Skull Full Pave depicts a heart-nosed skull and is set with 218 diamonds on the case, 824 on the dial and 126 on the bezel. What Hublot collection would be complete without a tribute to sport superstars? The King Power Special One was built in celebration of football coach José Mourinho. It’s HUB1240 UNICO movement features a self-winding chronograph flyback mechanism and calendar display at four thirty. Hublot also introduced the official watch of the FIFA World Cup™. It is the first timepiece Hublot has created utilizing the Big Bang Unico with a Bi-Retrograde Chronograph. Check back with iWMagazine.com for a complete list of Hublot’s 2014 releases now through April 3.